To start the marinade for the chicken get 1 plastic gallon size zip lock baggie. Add: 2 Tbsp. Lime juice, Stevia, Oil, Pepper, 1/8 Salt, and the 4 chicken breasts. Refrigerate the marinade for at least 15 minutes, and make sure the zip lock is closed tightly. Once the chicken is done marinating, either fire up your grill or get a pan hot enough to cook the chicken all of the way through. The internal temperature needs to reach at least 160 degrees. 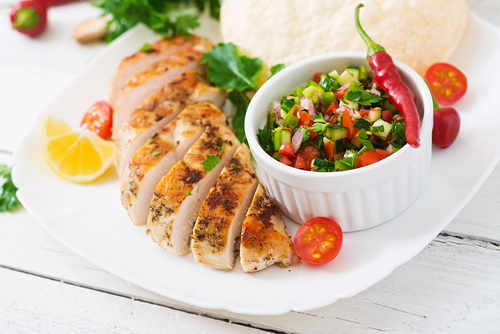 Get plates ready, and serve 3/4 cup Cowboy Caviar over the grilled chicken breast.Enjoy! This recipe is modified to fit into the PS1000 Phase 1 guidelines. NO corn, or honey are added. I loved this recipe. I added a little cayenne pepper to give a little kick to the chicken. Paired it with the carrot fries for a complete meal.